The lives and history of the potting families is fascinating. We are collecting stories and information related to the Potteries and the families that lived and worked there. These stories have been gathered from our own research and we believe them to be correct, although they should not be relied upon as being historical fact. Please contact us if you find anything that you believe to be in error. Thank you. Getting a handle on it. One of the skilled jobs in the making of teaware was the one of fixing the various handles onto the cups. This job required skill and experience. The 'handler' was the name given to this position and the handler was kept supplied with handles by two or three young handle makers. The handle makers job involved filling a handle shaped mould, laying the two halves one on top of the other and then jumping against it with his chest or abdomen to force the mould halves closely together and so creating a handle. Life working in the handlers room was neither easy nor lightweight work. When Samuel Scrivens was preparing his report on child labour in December of 1840 he interviewed many workers employed in pottery factories, amongst them were young lads who were employed at the Minton and Boyle Factory in the Handlers room. One of these boys was Herbert Bell aged 12, said to be very 'pale and phthisical' looking ( a phrase used to describe someone consumptive and 'wasting'). He told his interviewer that he got no pain in his chest from jumping on the moulds although both he and James Bevington, another handle maker, suffered with bad coughs. He had been working in the Handlers room for four years -since he was eight years old. Pay was 2 shillings per week which went to his father. He generally worked from six in the morning until six at night with half an hour for breakfast and an hour for dinner. They often had beef or Bacon with 'tatos'(potatoes) almost daily and had some time to play in the hour at dinner break. They had little or no schooling and could neither read nor write. The boys still seemed to be content enough in their work, even with occasional beatings! Both Herbert and James' fathers worked in the same room, as Handlers, as it was common practice to bring family members into the same line of work as their parents did. Although the life was hard and the hours long -and the health of the children was poor, with high mortality rates, we did trace both these boys into adulthood and found them still working as potters and Herbert Bell with a family of his own. Another generation of handle makers. There were no shortage of Radford families in Staffordshire in the 1800’s. They were employed in many different fields including wagoners, boiler makers, agricultural labourers, coal miners and as potters. One such family was employed as potter printers, but the family we are looking at included two brothers in particular –Samuel and John Britton. This Radford family, it would seem, did not originate from the potteries area or even from Staffordshire itself. Edward Thomas Radford, the father, was born in Tonbridge Kent and married Sarah Britton from Whitestone, Devonshire possibly in Camden Middlesex on 17th April 1833. How or why they arrived in Staffordshire is not known . Edward was listed in the 1841 census as a warehouseman and the family lived at ‘Eldon Street’ Stoke. Two sons had been born – John Britton born c1838 and Edwin/Edward born c1840. By 1851 Edward Snr had changed occupation and was working as a canal wharf porter. The two boys had been joined by more siblings – George born c1842, Samuel born c1844 and Emily born c1847. 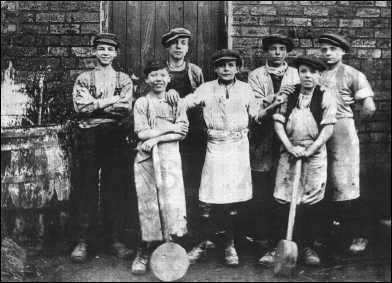 John (Britton), 13, the eldest son was now working as a potters warehouse boy and Edward,11, as a potters mould runner - hard work for anyone, let alone young lads. After the death of their mother the older boys moved into their own homes and lives with only Samuel and Alice remaining at home with their father (who now worked the railways as store keeper). Edward Jnr went from being a potters mould runner then went through a period of unemployment later to become a ‘Jasper ornamentor’. George moved from job to job and seems to have settled as a licensed victualler by 1891.The other two sons are listed below. The Eldest son of Edward Thomas and Sarah Radford. Born in Stoke and from an early age involved in the pottery business, firstly as a potters warehouse boy in the 1851 census. In 1860 he wed Ann Smith and together they had a large family of eight children, although the two eldest did not survive into adulthood. In the 1861 census he was potter –warehouseman by trade (whereas his brother, Samuel, was already employed as a ‘painter of flowers on china’). In the 1871 census John B had escalated to the position of Foreman in the decorating department and was still ‘foreman-decorator of china’ by 1891. Copeland certainly employed a ‘Radford’ as a painter from the period 1869 -1889, although not all entries are listed as ‘J’ Radford. He was known for painting Begonias and Blackberries in Particular but generally as a painter of 'flowers'. His pieces were gilded by Bell. His work was exhibited in the London exhibitions of 1871 and 1872 In 1881 John was widowed and left with a young family to provide for, although he did remarry in 1882 to Eliza Ball. His two eldest daughters, Annie and Ellen, had already followed in their fathers footsteps and both are listed as potters paintresses. By 1891 daughter Grace was also a paintress and Lily an apprentice. Of John’s two surviving sons George is listed as an Artist, presumably on china and Frank as an earthenware turner. John Britton died in 1895. If he is indeed the renowned ceramic artist of Copeland fame his has left some wonderful examples of his work as testament to his artistry. Samuel Radford was the youngest of the four sons. In the 1861 census Samuel is listed as a ‘flower painter on China’ at the age of about 17. For whom he worked is not known although it is possible that if his older brother, John Britton Radford, was indeed working for Copeland then Samuel might also have been employed there. His employment at whichever factory was to come to an end though. In 1863 in Fenton, Samuel married Mary Ellen Ward and they would move up to Glasgow in Scotland, where their first child William Ward Radford, was born in 1867. There were many potteries in and around Glasgow at that time and it was most likely work that took them there but they were back in Fenton, Staffordshire by the time their next child, Mary was born, a year later, in 1868. The family lived on Pratt Street and in the early eighteen seventies Samuel was employed once again as a ‘China painter and decorator’. By 1881 he was listed as China manufacturer, employing 77 persons (possibly during a partnership with Joseph Amison). Samuel went into the business of China Manufacturing in his own right by 1885 in High Street, Fenton. His sons William Ward, Samuel Jnr and Frederick all worked with their father either as clerks, Managers or warehousemen. None of Samuel’s daughters were employed in the business and most likely stayed at home. 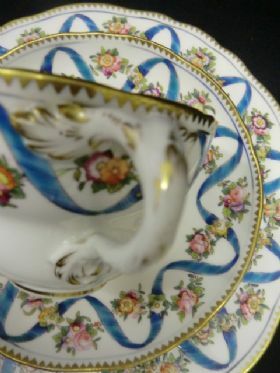 The Radford factory made some wonderful elaborately shaped and beautifully decorated teaware and its popularity led it to be sold as far afield as Europe and North America as well as the dominions. The company passed on to Samuel’s eldest son William and then, in 1931, was sold out of the family. It continued to run, with breaks during the 2nd World War and finally closed in the mid 1950’s. The factory was demolished around that period, bringing a close to another era in potting history. Although we may not be able to credit examples of Samuels ‘flower painting’ to him, we do have some lovely examples of the Radford factory teaware. It was the job of the Kiln 'Placers' to carry in and place the Saggars that were loaded with the newly made wares into the ovens ready for firing. It was a hazardous job due to the temperatures within the Kilns. Although fired wares would ideally be left to cool inside the ovens for 48 hrs men would often go into bring out wares within 24 hours of firing. The health issues caused were numerous - lung problems due to inhaling hot dust, nose bleeds and running eyes which could eventually lead to blindness. The workers would wear several layers of clothing to try and protect themselves from burning as they carried the still hot saggars out of the ovens. Often they would wear wet rags around their faces and hands to try and avoid injury. Picture : Kiln workers loading 'saggars' into the kiln. The saggars held the clay ware ready for firing. These were stacked inside the ovens. Gladstone Pottery, including the kilns, is now a Museum and open to the public. Photo by kind permision of Steve Birks, The Potteries. Harvey Adams was born c1834, in a place called Horton, Staffordshire. His father, Joseph, was a potter and married Ann Harvey in 1832. Although born in Staffordshire, by the time Harvey was seven years old the family had moved to Wybunbury, Cheshire perhaps following work and his father is listed as being a potter there. In the 1851 census the family are back in Stoke at East View Place. Harvey is registered as a china gilder. The home is shared by cousins who also work in the pottery trade. In 1855 Harvey married his first wife, Mary Stevenson (daughter of potter Spencer Stevenson) and together they have four sons Joseph, George, William and Spencer. In c1862 Harvey is in partnership and running a factory on High Street and Sutherland Road works under the name of Adams & Scrivener. When Scrivener retired his place was take firstly by Titus Hammersley and then by Titus' son George Harris Hammersley. 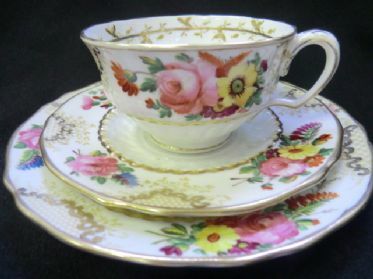 The business is renamed Harvey Adams & Co from 1870.Harvey Adams factory produced fine quality china, being well known for their embossed leaf decoration and floral handles - the specimens for these designs said to be taken from Lord Sutherlands gardens at Trentham. The invention of the moustache cup - which has been credited to Harvey Adams - probably took place during the early part of the factory’s history and possibly during the Scrivener partnership. A cup specially designed to save those waxed moustaches from melting into the hot tea by placing a guard across the rim of the cup – ingenious! Although popular in this country they were even more popular on the continent. During this period Harvey’s first wife died and he remarried, to his second wife Mary Watt. Together they have one son, Frederick Augustus and finally twin girls Annette and Mary Alice. Harveys factory continued to prosper. With John Marshall as Art Director , his influence brought about new designs in the Japanese and Chinese style. Orders come from not only UK but also Australian and American markets. In 1885 Harvey Adams retired from the factory. None of his children seem to have followed him into the business. His eldest son Joseph, became a surgeon and his daughter Annette the Head of a girls boarding school. In later census Harvey, along with his wife are found in 1891 in Stoke and then in 1901 in Ecclesall Bierlow, Yorkshire where their daughter is head of a girls school. Harvey seems to have maintained his links with the potteries by becoming a ‘Traveller’ (salesman) taking the latest china designs to prospective retailers. Harvey Adams and his factory created some beautiful quality china teaware, amongst many other pieces. The pattern books and numbers were continued on by his successor Hammersley & Co ho continued at Sutherland Road and later as Hammersley & Co (Longton) Ltd at Alsager Pottery, Longton.